On our last (sniff, sniff...pass me a Kleenex please) morning in New York we set our alarms to get up before the birds so we could traipse across the city to wait in a standby line for the Regis and Kelly show. But then we turned 'em off and slept in and I don't regret that decision at all. Scott still talks about wishing we'd gone to stand with the masses behind the barricade, in the rain and wave like idiots to get on TV for the Today show and I still give him my shoulder shrug along with a look and a "Really?" I'd much rather just watch from the comfort of my warm hotel room while sipping my steaming coffee. We packed up all of our stuff and checked it in with the hotel storage place for a ridiculous $3.75 fee per bag and headed out for our last adventure or two. Since it was our last day we decided to bat clean-up and hit a few things we had missed earlier, first heading down to Lower Manhattan. 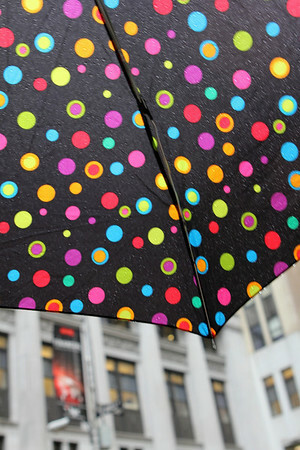 and tried to snap photos in the rain. 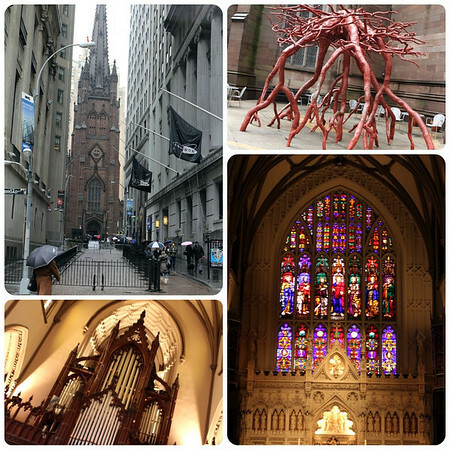 Trinity Church is a beautiful respite in the middle of all of those financial powerhouses. I wish I could tell you the significance of the red root sculpture but I can't. Isn't it interesting though? 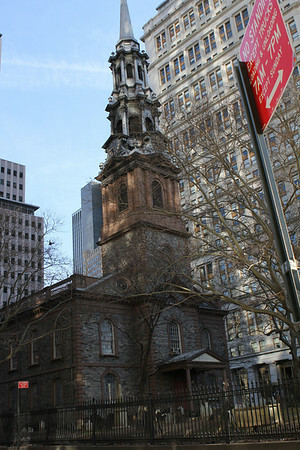 I can tell you though that Trinity Church is where George Washington was inaugurated way back in the day. 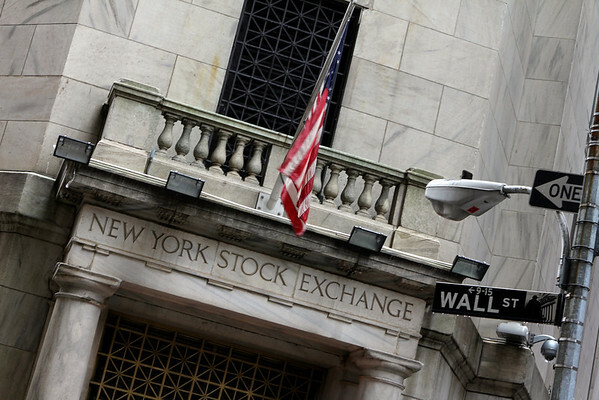 Well, actually I might be wrong, he may have been inaugurated at the nearby Federal Hall since New York used to be the capital of our good ol' U.S. of A. Anyway, Trinity, it's a church building and it's pretty and I'm sure many interesting events have happened there. 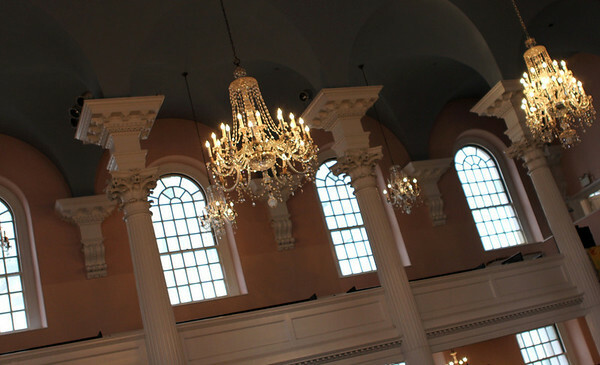 Next we went to St. Paul's Chapel and got to go inside this time. 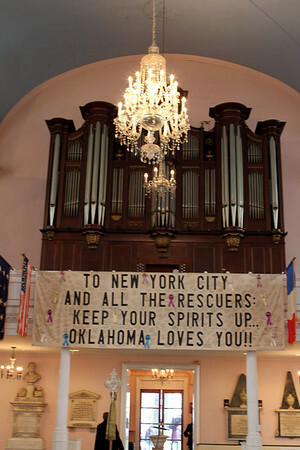 The chapel is not only beautiful inside but takes on more meaning when you see the displays of how the church ministered to those grieving their missing loved ones and to those working in the recovery efforts of the 9/11 tragedy. 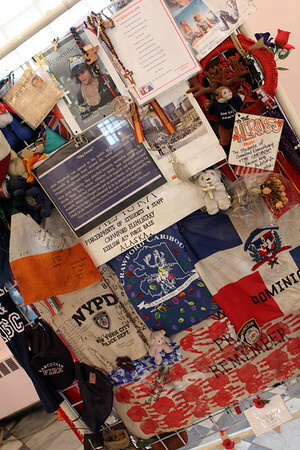 In a way it's like a mini-museum with mementos and stories around all four walls. 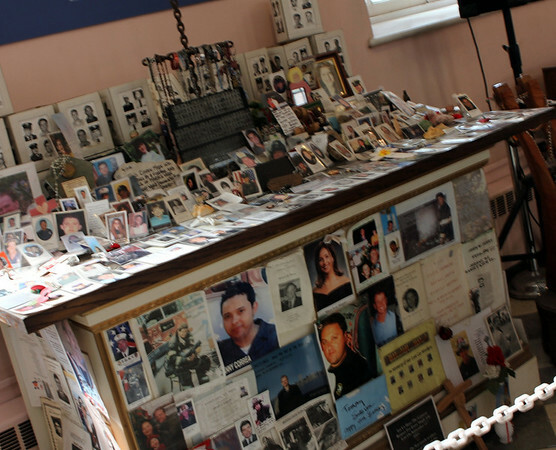 This is a replica of the altar that became a temporary shrine or memorial of those lost on 9/11. There are also letters and photos sent from all over the world to express sympathy and offer encouragement to the relief workers. 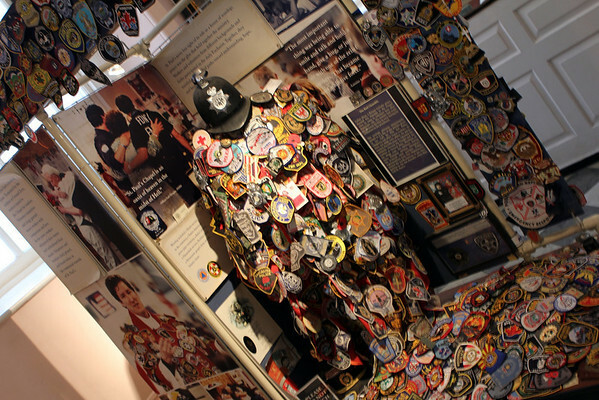 Badges from fire departments and police all over the country are displayed there as a remembrance as well. In the days and weeks after the tragedy St. Paul's offered a place to pray, a place for counsel, a place for hot meals and rest. 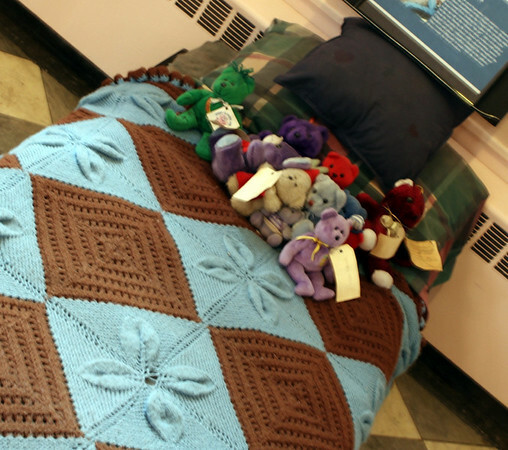 Cots like this one were set up for the recovery teams along with a stuffed bear sent as a token of love and care from all over the country. I fear there's really not a good way to segue from St. Paul's to shopping for cheap souvenirs in Chinatown without seeming disrespectful, but that's what we did next. 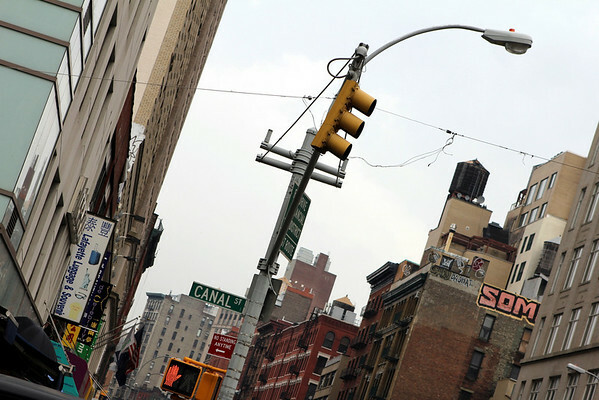 No sooner had we stepped up from the subway station on Canal St. then we started hearing things like You want Purses? Wallets? Watches? We do deal, you like? Coach? Vuitton? Good deal. And so on and so forth in a rather annoying and persistent way. We ignored the purse and watch diatribes as best we could but did pop into one stall for a few I *heart* New York souvenirs because they are so campy and classic at the same time. I wish we knew of a specific restaurant either in Chinatown or Little Italy (very close by) where we could have eaten lunch but we didn't and didn't feel brave enough to just pick one randomly either. Plus Scott and I both were so over the crowds and the high pressure hawking we were ready to only see Chinatown in our rearview mirror. 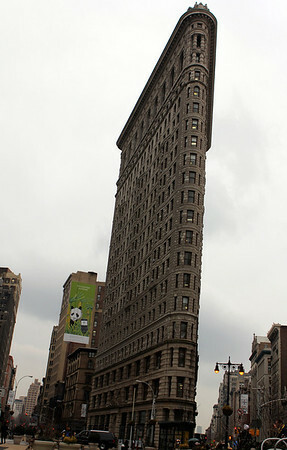 One short cab ride to the rescue and we were in Tribeca just like that ready for lunch at Bubby's. Once again I didn't feel quite hip enough to be eating there but still enjoyed myself. 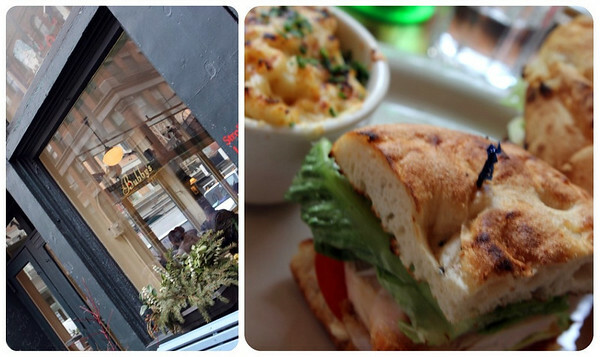 My sandwich was not quite what I'd hoped (I wish I'd chosen one of their breakfast dishes) but the white cheddar mac n'cheese was delicious. 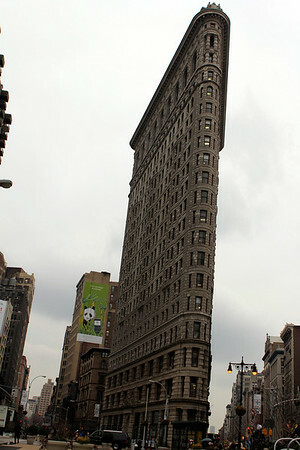 After lunch we rode the subway a little ways uptown so we could see the famous Flatiron building. How could we resist? Um...we couldn't. We had never had gelato before either (isn't that pitiful?) and quickly became fans of such a yummy frozen concoction (I got hazelnut & vanilla with chocolate chips, Scott got hazelnut & raspberry). 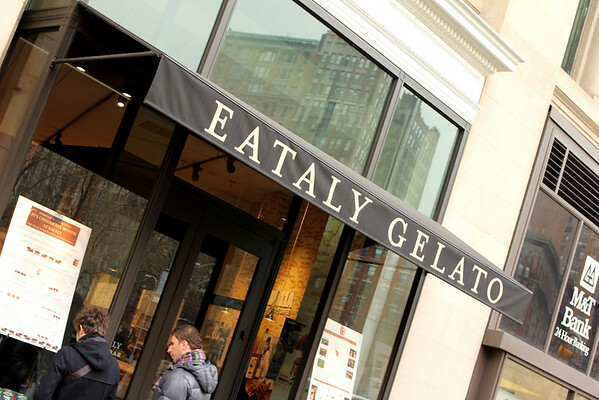 Our last afternoon in New York had quickly come to an end so we raised our gelato in a toast to our wonderful host for the last five unforgettable days and bid New York a fond farewell. 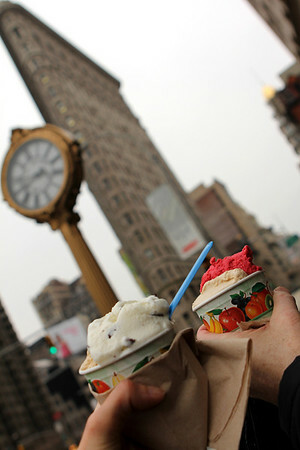 And then we gobbled that gelato right on up. Au revoir, New York, Au revoir. AWESOME trip!! thanks for sharing all your adventures!